I have a confession to make. I’ve sat on a “secret” for a while, trying to figure out how to understand it. It’s taken me a LONG time to get to this point, but it has to be said. My oldest child, age 23, born Lauren, is a trans-man named Christian. As a conservative, religious teacher, there are so many moving pieces to this puzzle for me. I know what my political party “believes” about this. I know what my church believes about this. I felt like I could not share with my community or many of my friends, so I was on my own with this paradigm shift. But this is my CHILD, my flesh and blood. As a teacher, I propose to love all my students as my own. How much more must I feel, then for my own children? As parents, you already know this. Here is my story on how I came to accept my son and how it has impacted me as a teacher. If this helps even one person, I am happy to have shared. Most of my career decisions have revolved around the needs of my children. I was a Special Education teacher before my children were born. When Christian (Lauren) hit first grade, we determined that he had severe dyslexia. (Yes, I still struggle with the correct gender pronouns.) Any reading disability is bad news for a child in a state where high stakes testing requires proficiency or retention in third grade. Christian was one of the first 100 students in Florida to take advantage of the McKay scholarship. This allowed him to attend a private school for the dreaded third grade and spend a year in a class of 1:8 with a veteran teacher of 30 years. She loved and nurtured him through the process of learning to read. From there, I transferred to a job at a charter school. This ensured that both of my babies could have access to a high-quality education where I could have more influence. Was this the equitable thing to do? Maybe not. Did it allow me to have input beyond that of a typical parent? Absolutely! Did it matter to me in the midst of my own child’s crisis? Not one bit! So when we first have children, these babies look into our eyes, and we believe that they are tiny versions of us. When we realize that they are their own people, it’s a little similar to grieving. We see our best and worst displayed in their words and actions. We survive the “stupid” period when we lose the respect of our tweens and teens, who think we know nothing. Once they have left the nest and are on their own, we become smart again. If you aren’t there yet with your children, I promise it’s coming! A declaration about lifestyle and needs from your child can be shocking or can force a change in your expectations. 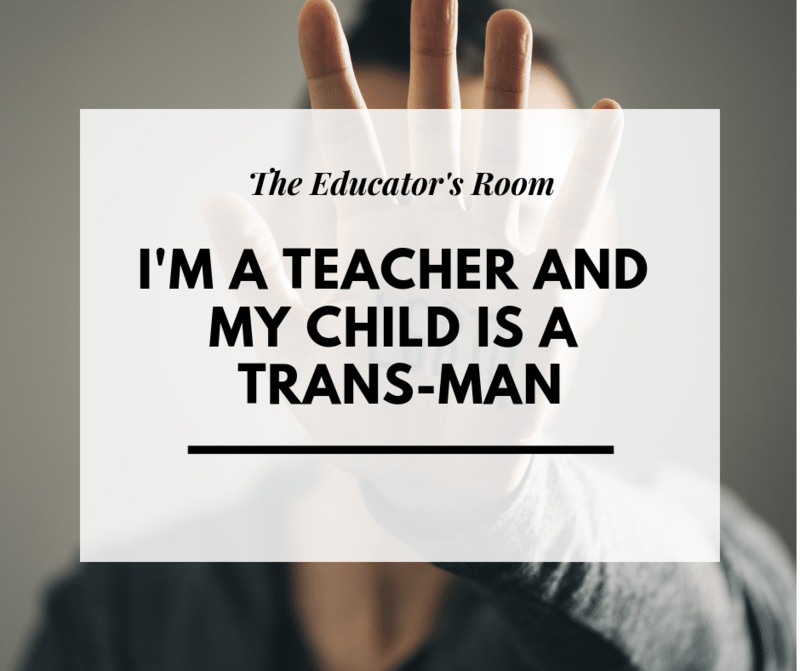 The coming-out of my son was not a sudden thing as we had held discussions about gender fluidity, sexual preference, and other somewhat taboo topics. In all of the conversations, I just wanted my child to feel loved. Once he made his announcement, I had to remind myself that it was about his life and not mine. I may have grown him in my womb, but once he could walk and talk, he was his own person. That’s an inalienable right. According to a study by the Human Rights Campaign, 70% of the polled constituents reported harassment and bullying directly related to their lifestyle. A survey by the America Academy of Pediatrics cites an estimate of 50% of teenagers identifying as teen males and almost 30% of teens identifying as females have attempted suicide. This issue grows annually, and it isn’t going away. So I try to take all my life lessons and reflect on them to inform my practice as an educator. I’ve learned 3 major lessons from my own response to my child’s declaration. The first lesson I am learning is that all these children are their own person, with a right to their opinions, their own needs, and their own expectations. They are not, in fact, a data point. Their lives outside of school are rich with experiences ( some positive and some negative) that shape who they are as people. They come to school in love, in grief, in confusion, in terror, in excitement, or in pain. We have one year to contribute to their personality by showing them love and acceptance, unconditional positive regard if you will. Yes, we need them to read on grade level and meet standards. Yes, we want them to go as far as they can in life. We want them to make good grades so that they can build their confidence and get into a great college. But how often do we ask ourselves, in what ways do we contribute to the child’s long-term sense of self and happiness? Will they be better people because of our interactions? Are we judging them in some way because of things they cannot control? I’m becoming a seriously more reflective person because of Christian. I like to say that when I turned 30, I realized that I didn’t have to be cool anymore. I didn’t have to worry so much about what other people thought of my choices. When I turned 40, I didn’t even have to be liked anymore! Alligator skin is a result of years of teaching, angry parents, unhappy administrators, and judgmental colleagues. I have had to reflect much more on this since Christian. I have had to examine my own bias. We all like to say that we don’t see sexuality, race, or gender and that we know that it’s there but doesn’t matter. However, of course, it matters! Sometimes a conscious choice must be made to respect others. However, while we are respecting each other for who we are, sometimes we forget that some things are NOT a choice. Being trans is NOT a choice. This is who my son is, and he should not have to apologize to you or anyone else for his life. We’ve spent too much time being judgmental of each other. At the end of the day, you only have yourself, your own thoughts, to contend with as you go to sleep. If you spend that time worrying about others instead of focused on your own peace, you are wasting your time. Your colleagues are not going to pay your rent, which was my mother’s gold standard of how much you should consider another person’s opinion. When I was a little girl in third grade, my parents got a divorce. I was the first person in my class for that to happen. Teachers had no idea how to support me through the process. My attendance became inconsistent, which affected my grades. Fortunately, the guidance counselor saw my struggle. She was the girl scout leader, and her invitation helped me tremendously to adjust. I was always that girl, whose parents were divorced, with judgment primarily from the parents of my peers. However, in our day and age, we are far more focused on social-emotional learning. My career has seen students become freer to express who they are to their peers and to society. I have always allowed students to be safe in my own classroom. I was the teacher they could come to for help and understanding. I didn’t have to solve their problem; it wasn’t mine to solve. I was the validator, the encourager, the resource for help. Looking at my own child, this was the approach I needed to step back and take. I wish I could say that I was a perfect mom. Typically, I lose my Mother of the Year Award early in the year, but seriously, there are so many things I wish I could change. I wish that it wasn’t such a difficult paradigm shift for me when my child revealed that he is a man. I do NOT want this to be a major regret in my life. I want to support my own children more thoughtfully and respectfully. There are people who are going to disagree with me. I know this. It’s not up for debate. I am a Mama Bear to the very end, even though they are grown. I urge you as an educator to pay into your students’ lives in a positive way. Be reflective about your practice. Be aware of your own bias, and hold it in check when working with students. Help your students through their social-emotional strengths to the best of your ability. Ultimately, we want our students successful. If you are interested in learning more about how to embrace a transgender student, Welcoming Schools offers resources and training to help you grow your own professional skills and practice. Love is the answer, no matter what it looks like. Thank you for showing and sharing your unconditional love.